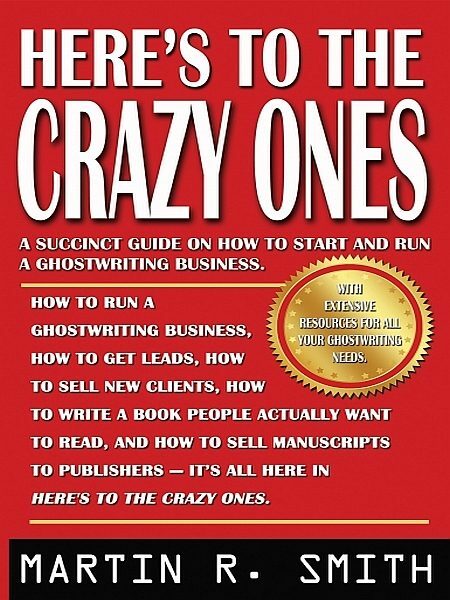 How to run a ghostwriting business, how to get leads, how to sell new clients, how to write a book people actually want to read, and how to sell manuscripts to publishers - it’s all here in Here's To The Crazy Ones . Here's To The Crazy Ones is a book about ghostwriting by a ghostwriter and the strange but gifted clients he serves. It describes how to find prospective clients, how to sell them ghostwriting services, how to write their books, and how to get those books published. And all in plain no nonsense language. The book is chock full of information ghostwriters can use to help them succeed, including mining for prospective clients; the all-important sales process which, if followed carefully, will almost always close sales by itself; how to spot and steer clear of con artists who prey on aspiring authors; what to include in non-disclosure agreements, ghostwriter-clients agree-ments; and many other valuable tips and techniques. “...writes about what I’ve given him, but significantly enhances the conceptual framework itself.-”David Silverstein, President and CEO, BMGI Corporation. “...service, speed, and professionalism are top notch! "-Dean Hohl, Former Army Ranger and Co-founder and President of Leading Concepts Team Leadership Institute. "Martin is a highly creative writer and editor ... resulted in [three] published books.”-Dr. Jim McCain, Ph.D. (The Business Doctor), owner and president, Business Works. “ I gave Martin a couple pages of notes and from this he constructed an entire book...”-William Kraut, CPA, MBA, CITP, Lead Independent Director InTest Corp. Partner Newport Board Group LLC. “... [from] slides and commentary, Martin wrote a business novel ... rated #1 ... by Amazon UK.”-Bill Gaw, President of the Lean Manufacturing Academy . “ Martin is a terrific writer, flexible and thorough ... easy to work with...”-Christopher Greenaway, publisher, CGW Publishing.